The Thomas Jefferson High School for Science and Technology (“TJHSST”) is a magnet school located in Fairfax County, Virginia. The school is highly selective and ranked first on Newsweek’s 2016 “America’s Top High Schools” list and is frequently in the top ten US News list as well. Out of the 3000 plus students who apply each year, about 480, or only about 15%, are offered a seat at the school. Read on to learn more about the TJ admissions criteria and process, and see if this prestigious school might be a good fit. TJHSST is free to attend and operates as a public magnet school in Virginia. Admissions are open to students who live in the following five counties: Arlington, Fairfax, Falls Church, Loudoun, and Prince William. The school itself has approximately 1800 students from ninth to twelfth grade and has an average student SAT score of 2198 / 2400 (a strong performance for any school). TJHSST is dedicated to providing students with a strong STEM (science, technology, engineering, and math) background, as well as preparing them to be lifelong scholars. TJHSST has particular strengths in its math and science curriculum, allowing students to explore computer programming courses as well as computational physics, signal processing, higher level mathematics topics, and more. Examples of some of the classes, which often go well beyond Advanced Placement standards include; Relativity, Electrodynamics, Neurobiology, Computational Physics, Advanced Microprocessor System Design, and Introduction to Engineering. The school also offers a variety of language options (including Japanese, Chinese, and Russian), as well as small group learning experiences for its students. 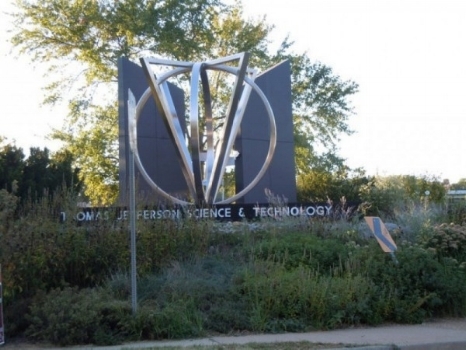 Seniors at TJHSST participate in a year-long research project or year-long mentorship program at a partner lab, which allows these students to get a feel for what the world of research is all about. Some examples of the year-long senior projects include 'A Hexapod All-Terrain Walking Robot" and "The Cultivation of Algae for Oil Generation and Biodiesal Synthesis". Students also learn valuable skills on directing their own work and managing projects, which can be a valuable skill in college. What's the TJ Admissions Process? How Does the Admissions Test Fit Into this Process? In order to attend TJ, students will need to apply for admission to join each year’s ninth grade class. There are limited additional entry points after ninth grade, though due to attrition a few tenth grade spots usually open up each year. We'll take you through the main steps that students need to take to go through the admissions process for 8th grade entry. For the general application process, students must first show eligibility to join the school – key requirements include residence in an approved district, a full year of algebra one in the eighth grade year, and a GPA of 3.0 or higher at the end of seventh grade. Homeschooled students can submit their math curriculum to meet the algebra requirement – more information is available on the TJHSST website. After this initial screening, qualified students will be eligible to take the TJ exam in the winter. The test lasts approximately two hours, with 45 verbal questions, 5 reading passages, and 50 multiple choice math questions. See below for more info on the test. Based on their test scores, some students will move to the semifinalist round, which takes place in January. The school admissions office uses a 'sliding scale' (see below) to figure out which students will qualify for the second, or semi-finalist, round. Please note: In order to reach the second round, students must show BOTH a GPA and a total score on the TJ admissions test that meet the sliding scale criteria, AND have scored at least 30 on the quantitative (math) part of the TJ test. Students who qualify for the semi-finalist pool will need to complete a student information sheet, or "SIS" and an essay. The student will return to the same site where s/he took the test to write the essay and fill out the SIS. The process will take approximately 2 hours. Students will also need to provide two teacher recommendations: one from a seventh or eighth grade math or science teacher, and a second recommendation by any other seventh or eighth grade teacher. No other material is considered for the applicants, so it will be key to have strong school grades and test performance to join TJHSST. There is no interview or portfolio submission necessary. Step 4 -- Be Chosen by The TJ Admissions Team! All students in the semi-finalist pool will go through a "comprehensive, holistic evaluation process that assesses their ability to meet the rigors of a demanding curriculum and the potential to be effective contributors to the school’s unique learning experience". TJ Test| What’s On The Exam? Because much of the admissions process is based on the TJHSST test, we recommend that students should take time to review the official sample. Access a PDF of an official TJ practice test by clicking the button below and you will also receive our report: 5 Top Tips for Using the TJ Practice Test Effectively. This resource also includes descriptions of each question type, helpful tips, and sample problems. In terms of content on the TJ test, the test is split into verbal and math components. The verbal section actually includes typical reading comprehension questions on five varied passages, logical reasoning problems, and scrambled paragraph exercises. The reading comprehension will seem relatively standard to students, but sometimes the logic and paragraphs questions need some review. The mathematics section will cover arithmetic, algebra, probability, statistics, and geometry topics. Students who have not covered these sections yet in class may want to read ahead, while other students who did geometry a year ago might need a refresher. Basic formulas (for example, the area of a circle or a triangle) are included, but students will need to remember how to apply these formulas effectively. The entire test is multiple choice, and there is no guessing penalty. This means students should fill in an answer for each question, even if there are some questions that are confusing. Note that TJHSST is strict about all materials allowed inside the school buildings for test day – students may not have calculators, watches, any electronic devices, or writing material beyond a few pencils. Another factor to remember is the test timing – while the exam lasts for two hours, it is self-paced and students may work on sections in their own chosen order. This freedom can be great for students who breeze through reading but need some extra time in math, or vice versa, but it also means that students should keep track of their time carefully. How is the TJ Admissions Test Similar to the SHSAT? The content and format of the TJ test is very similar to the content and format of the Specialised High School Admissions Test, or SHSAT, which New York students take to try to get into one of the ultra-competitive NYC public high schools, such as Stuyvesant. Note that the SHSAT no longer (starting in 2017) has scrambled paragraphs. Check out our articles on the SHSAT, and download more practice tests to use for TJ test prep. Also, master some key SHSAT strategies that can be used to excel on the TJ admissions test. What Should You Expect Regarding the TJ Essay and SIS? The essay and SIS will be computer-based and taken at the location where the student took the TJ entrance exam. However, it is recommended that students bring some pens and pencils which can be used to write down outlines and to brainstorm ideas (the administrators will provide paper). The word limit on each SIS question is about 380 words. The word limit on the essay is about 800 words. The SIS is an opportunity for the TJ school to get to know prospective students. The school wants to know why students want to go to TJ, and how their backgrounds and experiences (particularly in math, science, technology and/or engineering) have led them to the point of applying to Thomas Jefferson High School. The school is not looking for generic, predictable answers, but is searching for responses that evoke a student's individuality, his or her passion for an issue/subject, and evidence of the hard work and dedication employed to achieve his or her goal/s. The school is also evaulating if a student can pinpoint why s/he want to go to TJ versus another school with a strong STEM focus. So students should learn everything they can about the school and the curriculum and classes it offers, then dig deep inside and reveal why TJ is the very best fit for them. The essay provides another opportunity for the school to get to know what drives a student and how s/he thinks, but it also offers the school a chance to assess a student's writing chops. This means that students need to not only write honestly about their experiences and views, but back them up with evidence and with details that elucidate or prove their points. The school wants to know that a student is able to think (and thus write) critically and is a persuasive writer -- that s/he thinks carefully about word choice, develops logical arguments, and is able to make a cohesive summary. The admissions timeline changes slightly from year to year, but calls for applications open in late September, and the deadline for getting the TJ application in to the school is generally in mid October. The admissions test is usually admistered in the first week of December. If a student makes it to the second round (notifications usually go out in the second week of January), then s/he will be invited to provide an 'essay' in late January. Lucky students will know if they got admitted by the end of April. At Origins Tutoring, we believe that preparation for the TJ entrance exam does not have to be daunting and exasperating; instead, it can represent an important opportunity along a student’s path to learning mastery. Indeed, the perspectives and abilities acquired during preparation can last throughout a student’s school career and beyond. Our two-track approach to mastering content and improving test-taking skills means that students will not only thoroughly understand the fundamental concepts and skills on the exam, but they will also excel in using essential techniques to improve attitude, endurance and focus. Please call 917.287.7927 now for a complimentary consultation to discuss how we can help your child achieve his or her personal best on the TJ admissions test.